Zeigen Sie sich mit Appetit auf diese nächtliche Tapas-Tour durch Sevilla. Ihr Guide führt Sie zu versteckten Tapas-Bars und empfiehlt Ihnen die besten Gerichte und Getränke, die Sie probieren können, sowie den Hintergrund und die Geschichte der verschiedenen regionalen Gerichte. Tapas und ein Getränk an der ersten Bar sind inbegriffen. Danach entscheiden Sie, wie viel oder wenig Sie an den nächsten 2–3 Orten ausgeben und essen möchten. Guillermo was knowledgeable, friendly, full of facts and stories, and a really nice person to guide you around. Guillermo was our guide that evening. My wife and I were his only clients for the evening. After a short introduction, we found out that he had worked in Rhode Island years before and was fairly fluent in English. He was pleasant and took his time explaining what was in store for us for the evening. We made three Tapas bar stops. 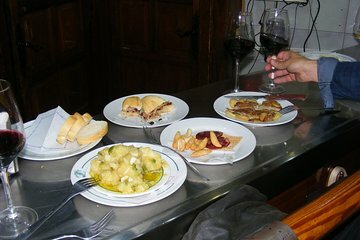 More if we had wanted to but the only the first stop Tapas and drinks were included. We would pay for what we get in the next two stops. That way we could chose what we wanted and how much to eat or drink and how much we will pay. He pointed out the type of food that would be good to eat in each tapas bar and what regions of Spain would offer the best quality of those tapas. I stayed with beer and my wife discovered Tinto Verazano with lemon, nothing more than red wine with soda water and a squeeze of lemon, something we could easily do at home. We tried the seafood tapas , their potato salads, meats in tomato sauce and of course, ham. After this was a walk around the neighborhood. It was great to see Seville at night, the city looked cleaner than earlier that afternon, perhaps because it was the offseason and the darker early evenings. One can see inside the different restaurants with ham hanging over the bar counter, people eating out on the sidewalks with gas heaters lighting up the streets. Then a walk around the Cathedral, the Alcazar and the Jewish quarters, with Guillermo telling tales, many of which are sad or ghoulish. This was our first night in Seville after a Transatlantic flight. We were ready to go to bed by 11 pm. Across from our hotel window, we could see the party was just beginning.